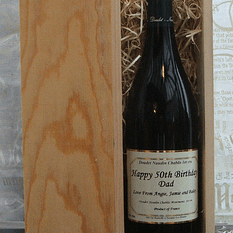 Personalised wine Doudet Naudin Chablis Montmains 1er cru, If this is a special gift you can select the delivery date after you checkout. Personalised Doudet Naudin Chablis Montmains1er cru. Montmains is on of the crus of the area of Chablis. The Montmains vineyards make complex, elegant wine and 100% chardonnay premier crus.